At its 49th meeting last month, the Paris MoU Committee approved the 2015 inspection results and adopted new performance lists for flags and Recognized Organizations. These lists will take effect from 1 July 2016. 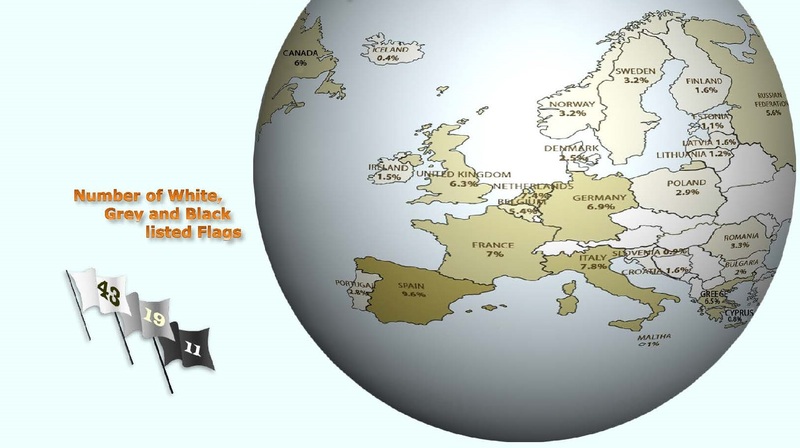 The “White, Grey and Black (WGB) List” presents the full spectrum, from quality flags to flags with a poor performance that are considered high or very high risk. It is based on the total number of inspections and detentions over a 3-year rolling period for flags with at least 30 inspections in the period. On the “White, Grey and Black list” for 2015, a total number of 73 flags are listed: 43 on the “White List”, 19 on the “Grey List” and 11 on the “Black list”. In 2014 the number of flags listed totalled 72 flags, namely 43 on the “White List”, 19 on the “Grey List” and 10 on the “Black List”. The “White List” represents quality flags with a consistently low detention record. Compared with 2014, the number of flags on the “White List” remains the same. New on the “White List” are Portugal and Spain, which were on the “Grey List” last year. Sweden has been placed highest on the list in terms of performance this year. The next in line of the best performing flags in 2015 are the United Kingdom, France, Denmark and Norway. On this year’s “Grey List” a total number of 19 flags is recorded. Last year the “Grey List” also recorded 19 flags. New on the “Grey List” are India and Switzerland, which last year were on the “White List”. Saint Kitts and Nevis has fallen from the “Grey List” to the “Black List”. The poorest performing flags are the United Republic of Tanzania, Republic of Moldova, Togo, Comoros and Cook Islands. For several years the Committee has closely monitored the performance of classification societies acting as ROs for flags. To calculate the performance of the Recognized Organizations, the same formula to calculate the excess factor of the flags is used. A minimum number of 60 inspections per RO is needed before the performance is taken into account for the list. In 2015 43 ROs are recorded on the performance list. Korean Register of Shipping (KRS). Bulgarian Register of Shipping (BRS). Compared with last year’s performance level, a small shift in RO performance in 2015 can be noticed. This year even fewer organisations have been placed in the very low (1) and low performing parts (1) of the list and more ROs have been placed in the medium part of the list. Details of the responsibility of Recognized Organizations for detainable deficiencies have been published since 1999. When one or more detainable deficiencies are attributed to a Recognized Organization in accordance with the criteria, it is recorded “RO responsible” and the RO is informed. Out of 595 detentions recorded in 2015, 74 or 12.4% were considered RO related. stringent banning measures in force since 1 January 2011. More information can be found in the 2015 Annual Report, which will be released in July 2016. The lists are also published on the Paris MoU website.